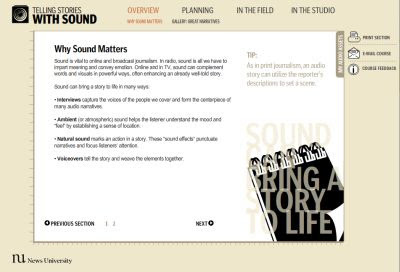 News University has a free online course titled “Telling Stories with Sound.” It’s geared toward print and online reporters who are looking for an understanding of how (and why) to use audio to help tell a story. The coolest part? While you’re reading your way through the course, you’ll see little boxes that you can click to play sounds. 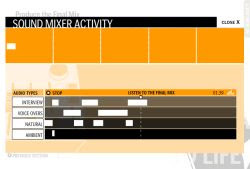 You can save these sounds to a clip file, and at the end of the lesson, you can use a simple flash-based audio editing program to arrange the elements and tell a complete story. When people used to ask me for tips on breaking into radio, I used to tell them to pick up a copy of Radio:An Illustrated Guide for $5 from the This American Life store. I still think that comic book offers a great overview, but it’s a bit dated. From now on, I’ll be sending folks to this News University course (and of course, Transom).